I’ll admit it… I prefer an early start when I have a long drive ahead of me. I often drive my family crazy by insisting on being on the road by 5:00 am. I would imagine it would drive any sane person crazy. Yet, that is how I like it. Get an early start and several hours down the road and look for a nice place for breakfast. The rhythm of the road is then established and the miles just melt away. On the West Virginia to Lansing leg, we set the alarm for 5:00. Packing up is a small chore in the motorhome… you get dressed and that is about it. Items that can fall on the floor need to be stowed properly. Hooking up the car, now that takes time. Trying to be as quiet as possible in deference to our sleeping neighbors, I drove the car to an unused campsite, then pulled the motorhome out into the road. Then I backed the car up into our parking spot, and backed the motorhome in front of it. Then began the process of getting everything hooked up. Even with all our experience so far, it took us until 6:30 before we left the campground. There are physically a lot of things to do to get hooked up, but things need to be checked and rechecked since a mistake could mean a mechanical disaster. We drove for several hours with me at the wheel and Alice in the navigator’s chair. We located a gas station/restaurant complex alongside the 2 lane road we were travelling, and decided to give it a try. I looked it over from the road and determined I could get the rig in and out safely, so we pulled in and started the fueling operation. While the gas was flowing, I walked down the parking lot and tried to figure out if there was anyplace to park for breakfast. The place was a madhouse. There were several semi rigs out back, and about a half dozen school buses. We figured this must be the place the drivers meet for breakfast after their morning run getting this community’s children to school. There was one pull-through spot, but I’d have to act quickly. Once fueled, I started up and pulled into the last spot. We had a nice breakfast, but I was uneasy. The parking lot was full, and I could easily visualize some desperate operator pulling in front of me, causing us a long delay while we unhooked, backed out, and rehooked (you can’t back a towed car up like you can a trailer.) When we came out, we were in the clear, so my worries had been in vain. We quickly got back on the road and were making good time again. Some miles down the road, the GPS alerted us to an unanticipated turn. We were miles from the turn according to the map, but we decided to trust the machine’s judgement. It seems the road it chose was a few miles shorter than sticking with the highways. This road was a two lane, and it twisted over hill and dale. Once again, it is a stretch of road I remember among all those we’d traveled. Although it saved us a few miles, we lost a lot of time on this crazy stretch. We finally saw the reattachment point onto the highway ahead and breathed a sigh of relief, until we noticed a road crew running an asphalt chewing machine between us and the entrance ramp. We had yet another delay until the crew waved us through. Our next stop was to be a rest area near Cleveland, where we’d arranged to meet our friends Randy and Stephanie to drop off some maple syrup and have a visit. Randy has been a good customer of my maple syrup since the beginning. Shipping syrup in glass jars is no fun, so we try to drop it off whenever we can. Plus we get a visit out of the deal. When we got on the Ohio Turnpike, we called them on our cell phone and they started toward the rendezvous point. When we pulled into the place, there they were waiting for us. We pulled the rig into the semi truck parking area and walked inside to get a meal to go. Then came out and sat in the motorhome and had a very nice lunch. These truck drivers seemed used to close tolerances when pulling into and out of the lanes on either side of us. While we were chatting with our friends in our living room, several rigs maneuvered within an inch (I swear) of touching our mirrors. I looked over at the drivers, and they were as unconcerned as could be. “These guys are pros,” I thought to myself, so I let them do their thing. And there were no mishaps. All too soon it was time to say goodbye to our good friends. We pulled out of the parking lot and onto the entrance ramp. I suddenly pulled over to the side and put it in park. “What’s wrong,” Alice asked. I’d patted my pocket and felt my car keys. When we’d walked in for the food, I’d turned off the car and locked the doors. I’d forgotten to unlock the steering on the car, and nearly drove on the highway with it; a serious and potentially dangerous mistake. I corrected it and we resumed the journey. We arrived in Lansing some hours later tired but happy. We unhooked, backed the rig into my parents’ driveway, and had a nice visit. I slept well that night. We spent two days visiting in Lansing, then hit the road for the final leg of the journey. For the only time on this trip, the maps and GPS could get put away. We knew this 500 mile stretch of road as well as we knew our own names. We’d traveled over 3,000 miles, and both agreed it was a lovely trip. We were busy planning our next one before this one ended. Steve and John both work for Stantec, which is an international environmental consulting company. Their job this summer is to walk transects under wind turbines looking for bird and bat kills. When found, they catalog and collect the carcass. 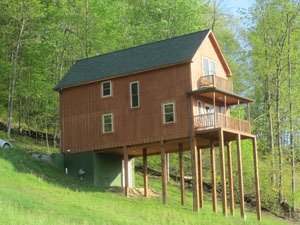 The site for this project’s wind farm is the top of a hill in rural West Virginia. These hilltops collect a lot of weather. The day we arrived proved to be one such weather day. When rain is predicted along with possible lightning, the guys must postpone their walks because of the danger of lightening strikes. If possible, they still need to complete the days surveys, so delays often mean longer days for them. This particular day was so long they ran out of sunlight. The next day was to be their day off, so they used it for a catch up day. Steve had told us their house was difficult to miss, and when we drove up, we could see what he meant. I guess this type of stilt construction is common in California on the hillsides, but I’d never seen anything like it up close. I felt the urge to grab some 2x4s and cross brace those long stilts, but managed to restrain myself. We had a very nice visit with Steve and John, including a typically delicious meal prepared by John. We stayed until after dark, and realized on our way home that we would arrive at the campground after 9:00 pm, when the gates are closed and locked. We’d received instructions, including the combination to the lock on the gates, but this would be the first time we’d use them. It did take us a while, but we eventually got inside the gates and got them locked again. Our little motorhome nest was a welcome site. When we opened the door and the bottom step automatically slid out on its tiny electric motor, we smiled at each other. This place was becoming home. Then the water pump died. We’ve learned to turn the water pump off at the main breaker box when we aren’t using it. It had become second nature to walk by and flip on the water pump switch and see its reassuring red glow. That night there was no glow and no water. I thought for a minute and figured it was most likely a fuse. Marcia had shown us where the majority of the fuses were located, so I grabbed my headlamp and went outside and opened the basement door of the motorhome that housed the fuses. These were row after row of normal automotive fuses… about 40 of them I think. “Great,” I thought. “I’m going to be out here all night swapping out fuses. We were both tired and just wanted to settle in for the night. Then I noticed a tiny red LED light glowing between two fuses on the bottom row. Hmmm. I pulled the one out to the right of the light, and it looked fine. I pulled the one to the left out, and it was clearly blown. I searched in the car’s glove box and found the correct fuse, and within 5 minutes of starting the diagnosis, we had water again. I’d never seen a fusebox that identified the blown fuse so clearly before, and now I wonder why they aren’t all that way. “Yes,” he said. “Just press the doorbell and they’ll buzz you in.” Press we did and in we were buzzed. It was a pretty dark and seedy looking bar. The bartender was a young pleasant looking woman. Had she not given us the good vibes she did, I think we would have fled right then and there. We learned they had to buzz you in because this was a private club, which is how they get around the rules against serving alcohol. We found a booth near the only window, sat down and waited for our waitress. Of all the places we ate on this trip, that funky little bar in Buckhannon was the most memorable. The service was superb, food was good, and I think everyone in the place came out and talked to us at one time or another. Even the chef came out and accepted her deserved praise for the breakfast. When we asked for directions to the glass blowing studio, our waitress/bartender told us she lived just down the road from him, and proceeded to slide into the booth next to Alice and draw us a map. She then called him to be sure they were open that day, and told us when the best time would be for us to visit. The only downside to this breakfast adventure was there was a parking ticket on our car. We’d parked in the shade for Franco’s sake, and hadn’t noticed the “Permit Parking Only” sign hidden in the branches. We were $25 poorer and not much wiser as a result of that episode. 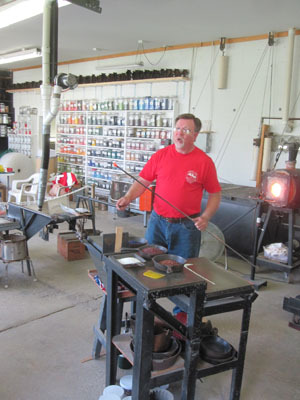 The Ron Hinkle Glass Studio was another high point of the trip. Ron is a very nice guy that seems to enjoy explaining his craft. Together with his assistant, we observed them making some lovely glass vases and listened to his running commentary. This impressed us both since Ron has been in the business for 3 decades. When we walked back to the gift shop, we stopped and bought some gifts and then headed back to Elkins. It seems there had been an accident on the road at the bottom of Ron’s driveway while we were there, such that we were not able to turn the direction we wanted to go. We got kind of mixed up as a result, and wound up having to turn around a couple of times. At one point the bungee cord on the rear of the canoe on top of the car came off, so I had to park and walk back to retrieve it. The roads were quite narrow, and there was almost no place for me to walk. The cars were going by at a good clip too. I was grateful to get the cord back on the canoe, and maneuver the car back into the flow of the traffic. Our hookup and departure went a bit more smoothly this time. We were learning how to work together to make sure no steps were missed. The previous owners of the motorhome had purchased a regular car rear-view mirror and had installed it such that a view out the back window was possible. I’d learned to glance up at that mirror, and could see the car with the canoe on top, and was reassured that things looked ok back there. I’d heard of RVs that had a rear-view camera and screen on the dashboard, and hoped an upgrade to that technology might be in our future. One problem that had surfaced the day before was the passenger side mirror. There was an electric motor that allowed the center portion of the mirror to be adjusted. As we went down the road, though, the mirror slowly moved to the point that it was out of adjustment, and could no longer see the right lane. Fortunately, Alice could see just enough of the lane in the mirror to allow us to move over safely. In general, though, I tried to stay in the right lane. I hoped we’d be able to stop in a Walmart parking lot so I could look at the mirror and try to figure out how to tighten it. We stopped regularly for gas. We calculated the economy a couple of times on the trip, and got a bit more than 10 mpg once, and around 8 mpg the next time. It seemed to fluctuate based on the terrain, which made sense to us. We were moving a lot of iron down the road when the towed car was taken into consideration. Early afternoon we spied a likely looking exit and took it. 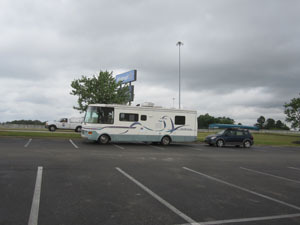 We were happy to see a Walmart, which is well known for its large parking lots. We drove around until we found a secluded end, and parked for a while. I got out our folding table, which I carefully placed under the passenger side mirror and climbed up. After some looking around, I found what looked like a set screw that might tighten the swivel of the mirror. I couldn’t see it though. I asked Alice to look it over from inside, and sure enough, she could see the allen wrench head. I had no allen wrenches along, but I was pretty sure Walmart would have some. Armed with our shopping list, I headed inside while Alice and Franco held down the fort in the motorhome. I had all the keys for the motorhome duplicated once inside, and purchased a nice set of allen wrenches, as well as staple foods for the trip. Once back to the RV I climbed back onto the table and with Alice sitting in the driver’s seat, was able to get the mirror pretty well adjusted. Unfortunately, the automatic adjustment no longer worked, probably as a result of my having taken it apart. One more thing to put on the list of things to get looked at. We pulled out with a bit more confidence and headed back on the highway. As the day lengthened, we started looking for a place to spend the night, and settled on Elizabethtown, Kentucky. We got off at the right exit and followed the directions to a small privately owned RV park. The people there couldn’t have been nicer. I needed propane, so the owner took me through the process for the first time, and was very patient as he showed me how it all worked. We pulled into our parking spot, unhooked the car, loaded up the dog, and headed out to find a place to eat supper. The date was May 3; my 60th birthday as it happened. 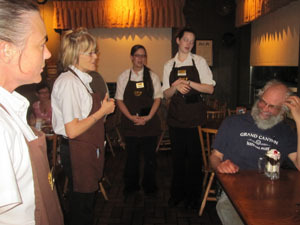 We ate at the Cracker Barrel, and I happened to mention to our waitress that is was my birthday. She explained I got a free dessert with the meal, which was nice. What she didn’t explain was that all the available wait-staff would deliver my dessert with a round of “Happy Birthday.” Alice managed to get a picture. I was really touched by the whole thing. We were up early the next morning, and drove out to the dump station to practice emptying our tanks. We probably didn’t need to dump yet, but the place was empty and we knew we would make some mistakes, and didn’t want an audience if we could help it. The sewer hose that came with the motorhome was in pretty bad shape. The end, which needs to fit smoothly into the socket in the ground, was so mangled that it was impossible to get a reasonable fit. And we had neglected to close the valve on the sewer tank, so the entire pipe was full of sewage. I had a 5 gallon pail along, so I unhooked the small hose fitting on the end of the pipe, and emptied that bucket by bucket (AFTER I closed the valve.) Once the pipe was empty, I could open the valve for real, and empty the rest of the tank. It was then we noticed another break in the sewer hose. We managed to turn it up in time to avoid too much of a spill. We then closed the sewer valve and opened the grey water valve, rinsed everything off, and were ready to hit the road. We added “sewer pipe” to our shopping list. Once back at Marcia’s place with the drive-away title and temporary license plates, it was time to hook up the car and say goodbye. We had made some very good friends, both human and canine in the short time we were there, but the road was calling. We hoped to get several hours down the road to make the next day’s drive to Mammoth Cave, Kentucky, a bit shorter. We pulled out of the driveway and onto the road, and I began to get the feel of driving such a wide, tall, and long vehicle. Our next stop was the Walmart in Mena, where I hoped to pick up a prescription I’d forgotten in the flurry of packing before the trip. As we made our way down the road, I felt the brakes were not up to snuff. I had to press down more than I was used to, and felt some resistance in the pedal. I knew this vehicle had been sitting for a long while, so figured this might be one more kink that would get worked out as I put some miles on it. We made it to Walmart and parked over to the side. I walked in and did my business at the pharmacy. When I came out to the motorhome, where Alice and Franco were waiting, I noticed a very distinct smell of brakes around the vehicle. It had to be us, because I’d parked in a very isolated part of the parking lot. Uh-oh. We decided to drive the motorhome and car back to Marcia’s place. We knew she’d just had the brakes done, and figured she’d know who we could call to get them looked at. On the drive back to her place, it became very clear to me that something was seriously wrong with the brakes. When we got back to the house, no one answered the door. Uh-oh. I walked around a little thinking she might be somewhere in the back 40. I peeked in the garage and noticed her car was gone. Uh-oh. By the time I’d walked back around the house, her car was parked near the motorhome and I saw her with a puzzled expression on her face. We quickly brought her up to speed regarding the brake issue, and she took us inside and helped us call the place that had done the brakes for them. They told us to bring it in right away, which we did. Marcia kindly invited us to use her spare bedroom while the motorhome was in the shop. Here was a silver lining indeed. We’d all felt the visit had been over too soon, and now fate was extending the visit for *hopefully* not too long. We received a phone call from the repair place late that afternoon. They’d found the problem, a bad brake hose, and had ordered the replacement. The part was to be delivered by 11:00 the next morning, and baring no unforeseen circumstances, we should be on the road by 3:00 or so that day. It was clear to me from speaking to the mechanic that we were in good hands. They understood we were scheduled to be on the road, and they were doing their best to get us safely on our way. Noon the next day came another call. The wrong part had been shipped. The hose was right, the connectors were good, but the thing was a foot short. The correct hose was located, and it should be in, you guessed it, by 11:00 the next day. Marcia took this new piece of information is stride, and kept us entertained. I got to drive her super-cool zero turn riding mower. I was sorry when her large lawn was completed and I had to get off it. We had several nice walks with the dogs and a short visit to Lake Wilhelmina. About mid day the next day the mechanic contacted us. The correct part was in, and installation should be completed soon. We were all pretty happy, and got our things together in anticipation of the final call from the mechanic to come and get it. We said our goodbyes again and drove our car back to Mena. We paid our bill, hooked the car up, and were ready to go in an hour or so. One thing about hooking up the car… if you miss a step, like forgetting to shift the transmission into neutral, or turning the key to accessory to unlock the steering, you can do damage to the car and/or cause the towing to be unstable. So we checked and rechecked until it was time to pull out into traffic and commence the trip. As I said earlier, I was still getting the feel for this massive vehicle. Probably based on experiences so far, I did not fully trust the brakes, so drove quite conservatively. Also, this thing is so wide that the daydreaming you can often do with a car between the lane markers is not an option. I found I had to give a great deal of concentration to my driving, even to the point of not being able to glance over to the side to search for sunglasses, etc. We drove for several hours, then pulled off at an exit to get some gas. We found that something simple like pulling into a gas station needed some planning. Since we couldn’t back up with the car in tow, we had to be sure we’d be able to drive out once we drove in. We probably pushed it too long the first day of driving, and wound up pulling into a Shell station that seemed to have several semi trucks out back. I asked the clerk if we could park our RV there for the night. He said sure, but wouldn’t we rather stay at an RV park with hookups? I said that would surely be better. He explained he was in partners with an operation 40 miles down the road (in the direction we were going) that had just such a place, with drivethrough, etc. I told him it was a deal. He gave us directions, and we headed back on the road. The place we were to stop and pay our fee was a Super 8 motel just off the highway. We pulled in and I asked the clerk about camping for the night. The clerk seemed puzzled. “Great,” I thought. I’m so tired I’m about ready to fall down. Then the fellow that had suggested I come here from 40 miles away walked in. He’d followed us to the hotel, and handled the transaction for us. The place was just about deserted, quiet, and very welcome. We pulled in, hooked up, and curled up in bed. Alice and I embarked on an adventure a couple of weeks ago. Several good stories presented themselves which were hopefully files away for later. The purpose of the adventure was to purchase and pick up a motorhome we’ve been looking at for some time. The ‘home was located in the mid-western part of Arkansas. Since we decided to bring out dog along, we couldn’t fly or take other mass transit, so we settled on taking the car. Franco’s crate just fits into the back of our Vibe if the back seats are folded down. We also brought out Mad River Kevlar canoe along in case some inviting water presented itself. The problem with taking the car was that we’d have two vehicles to drive once we made it to Arkansas. I did some research, and learned there were 3 ways to tow a car behind an RV. They are no wheels down, 2 wheels down, and 4 wheels down. The first involved buying a car hauling trailer, driving the car up onto it, securing it, and then driving away. There are none of the car’s wheels touching the ground, hence the “no wheels down.” Two wheels down involved purchasing a 2-wheel trailer/dolly. The front wheels of the car are driven up onto this dolly, are secured, and then driven down the road with the car’s back wheels on the ground. 4 wheels down involved bolting a sturdy tow bar onto the car and buying a tow arm set and an auxillary car brake combination. Using this system, all 4 of the car’s wheels are on the ground with the car’s steering unlocked, so it steers itself around the corners. As revealed in the “Ted the Auto Mechanic” post (click HERE for that story,) I chose the 4 wheels down option and installed the tow bar on the car. This I bought new since the part is specific to the car. I searched for several weeks on eBay until I found the tow arm and auxiliary brake unit on eBay. We also had to buy a receiver drop for the RV since the height of the receiver on the was too high for the car. Fortunately, the RV receiver and our Ford pickup receiver were the same height, so we were able to practice hooking up and towing the car before the trip. With everything purchased and tested, all that was left to do was pack the car and take off. Alice worked the day before we left, so I spent the day getting the car ready. It took me ALL DAY to get everything put away the way I wanted it. That night the High School was putting on their annual play, which Alice and I try to support every year, so I drove in to town, picked her up, and we attended the play. We got home later than we would have liked, went to sleep with the alarm set for early the next morning. Our destination was Des Moines where I’d found a Motel 6 that accepted pets. We got a good start and thanks to Alice’s exceptional navigational skills, we found the hotel without much trouble. This place was right next to the Des Moines Airport. It was a well used place that seemed somewhat short on maintenance. We found a place to eat and learned upon returning to the hotel that the heat was out. We spent a chilly first night on the road. In the morning, we were up early for a short walk with Franco, and a repacking of the car for the leg of the trip that would take us to Marcia’s place in Arkansas. I’d brought the suitcases down to the car and had Franco on his leash. Now Franco is a big ball of love to everyone he knows, but he is a 90# German Shepherd male dog. As we were walking to the car, there were a couple of large males that were obviously drunk, talking in loud voices very near to other people’s rooms. They looked me over as I approached them and did not lower their voices nor alter their path to avoid mine. They continued their talk and swagger until they noticed Franco. I happened to be looking their way when they noticed him as he studied them intently. They both stopped in their tracks and their eyes were bulging. “That’s a big dog,” one of them said. “Yes, he is big,” I replied. Two formerly loud swaggering guys tiptoed quietly away from us. I smiled to myself at the time it happened, and have smiled about it over and over since that day. The drive to Mena, Arkansas took us through some beautiful country. Marcia’s place was 33 acres in a very nice section of the surrounding countryside. We both really liked the place. Marcia lived in a comfortable brick home surrounded by acres of beautifully maintained yard and fields, and some very nice woods and streams. She also had 8 dogs, all of whom had a story attached to their rescue. Marcia, it seemed, had a big heart to go with her beautiful property; a heart that included making homes for dogs that wouldn’t otherwise have one. Franco fit into this group of dogs with a few hiccups. A couple of the dogs wanted nothing to do with any other dog, and growled when another dog came near. Franco respected that. Some were exuberant extroverts which Franco had to get used to, since his pack has been mostly human all his life. One dog in particular wanted Franco to be sure to acknowledge his leadership role in the community, which Franco eventually also accepted after a few incidents. All-in-all, it was a very good social opportunity for Franco. It was a great time for us. Marcia welcomed us into her home with the native graciousness that must have given rise to the phrase, “southern hospitality.” We got the grand tour and immediately felt at home there. We saw the motorhome and really liked it. We decided to sleep there that night to get the feel for the place. In the morning, we all piled into Marcia’s car and headed for the Mena Department of Revenue office to do the title transfer. It went like clockwork and we were soon back at her place and readying the ‘home for the next leg of our trip. You are currently browsing the Rural Life in the UP of Michigan blog archives for May, 2012.